Counting problems are part of permutations and combinations. In the recent entrance tests and campus placement tests, good number of question are given. If we take numbers upto 699, Then the hudred's place take digits upto 6. But the digits in tenth and unit places take upto 9 from 0. If we fix digit 3 in hundred's place the remaining digits can be filled in 10 ways each. If we fix digit 3 in tenth's place then the digit in hundred's place can be filled in 7 ways (0-6), and units place can be filled in 10 ways. If we fix digit 3 in unit's place then the digit in hundred's place can be filled in 7 ways (0-6), and tenth's place can be filled in 10 ways. Find the total number of ways of reaching B from A If only right and up steps are allowed. We need to calculate the number of ways of reaching every node or junction. Take last node B this can be reached in two ways, which have already values 35 and 21. We add these two to get node value for B. How many different routes are available from P to Q? 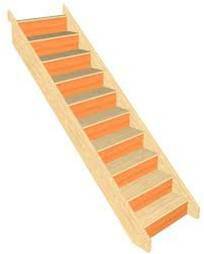 How many ways A boy can reach the top of stairs which contain 10 steps, when he can take either one or two steps every time? If the boy takes the first step then the remaining (n-1) steps can be covered in = a(n-1) ways. If the boy takes the first step with 2 steps then the remaining (n-2) steps can be covered in = a(n-2) ways. So this is nothing but Fibonacci series : 1, 2,3, 5,8,13, 21, 34, 55, 89. How many ways 10 houses can be painted with only two colors, white and blue , where two houses consecutively cannot be painted blue. The first house we can painted with white remaining houses can be painted in = a(n-1) ways. But if the first house is painted blue, the next house must be white so remaining (n-2) houses can be covered in = a(n-2) ways. Similarly if we fix 1 in 6th, 5th, 4th, 3rd, 2nd, 1st then total digit 1's upto 127 = 7 x 64 = 448.
now numbers 129 to 159 are 31 numbers where digits change in 1 to 5 positions. 159 has 5 digit 1s. Now digit 1 in 8th position remains constant and numbers from 1 to 5 positions change to form numbers from 129 to 159. If we fix 1 in 5th position, remaining positions 1 to 4 change by 2 x 2 x 2 x 2 = 16 times. and in all these 31 numbers 1 in 8th position kept on appearing in all these numbers. So another 31 digit 1's. Now number 160 has 2 digit 1's. so total 562. 2, 3 are two digit numbers in binary where their left most digit is 1 and right most digit changes from 0 to 1. so total number of 1's are 2 in left most position and half of the numbers which appear in the remaining digits are 1's. 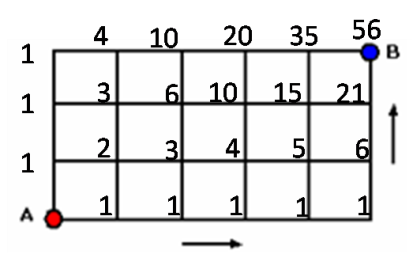 4 to 7 are three digit numbers where digit 1 appears in left most position 4 times and the remaining digits are 4 x 2 = 8 and half of which are digit 1's. 128 contains one digit 1.